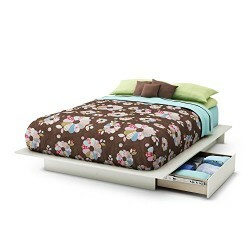 The clean design allows this bed to match any decor and will survive any trend updates through time. Featuring storage below, maintaining a clean and organized room is a breeze. This bed is the perfect solution for anyone with a lot of personal belongings and is limited on space- you can easily retrieve frequently used items or store seasonal items that you don’t need right away. Shop with confidence knowing that we proudly stand behind this Step One Platform Bed with a full 5-year limited warranty. Mattress and accessories not included. Assembly is required – we recommend 2 people to assemble, tools are not included. Shipped in 2 heavy boxes – make sure to have a friend with you. Can support a total weight of up to 500 lbs. Made in Canada from certified Environmentally Preferred laminated particle panels. South Shore Furniture’s support team is available 7 days a week if you have any questions. ECO-FRIENDLY: Manufactured in Canada with certified Environmentally Preferred laminated particle panels, the top surface of the bed frame is also laminated. 5-YEAR LIMITED WARRANTY: Shop with confidence knowing that we proudly stand behind this platform bed with a full 5-year limited warranty. Assembly is required.